Skip the spa—Laywine’s Pens and Organizers is your new oasis of calm in the heart of Bloor-Yorkville. Since 1987, they have been selling the finest writing instruments and materials you can find in Toronto. And for those who love the art and expression of writing by hand, there is no better way than with high-quality paper and a fountain pen. Almost everything that the owner, Peter Laywine, carries in the store revolves around their collection of exquisite fountain pens. All the paper they carry is thick enough so that ink doesn’t bleed through with expressive strokes. The fine display cases contain a wide variety of nibbed writing instruments. The first that Peter shows me is a sterling silver fountain pen made by Yard-O-Led, an English company that started by making propelling pencils. These are a type of mechanical pencil where you rotate the barrel to extend the lead. Their patented design allowed them to store a total of 36 inches of lead in the barrel, hence the company name. Like their original pencils, the Yard-O-Led fountain pen, which Peter places out on the cabinet (cover photo, above) is delicately made. It’s from the Viceroy Grand collection and features a hand-chased exterior: fine patterns that are hand-hammered into the surface of the barrel. It also has traditional silver hallmarks that certify the purity and date of manufacture. Peter visited the factory a while ago to see the craftspeople in action. 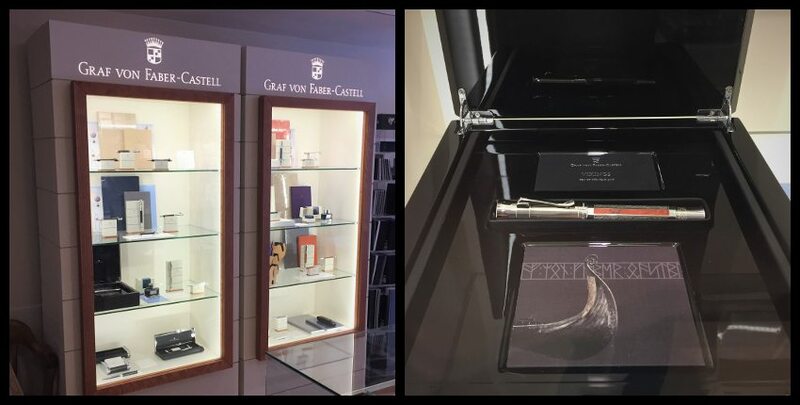 Another fountain pen maker on prominent display is Graf von Faber Castell. Like Yard-O-Led, they also had their beginnings in making pencils, and are still a leading manufacturer of colouring pencils for artists and schools. They make a range of high-quality fountain pens, including a “Pen of the Year” series commemorating nature or history. Peter has a case displaying the 2017 Pen of the Year: Vikings, which has a Nordic birch barrel and the company name inscribed in runes. Elsewhere in the display case is a playful nod to the company’s history: a set of leather elephant-shaped pencil holders that recently roamed around the Village of Yorkville Park for the company’s Instagram feed. In addition to the fountain pens, Peter looks for other products that can help satisfy his customers’ longing for creativity. He started selling private-label inks after finding a supplier at a convention who was willing to sell him colours in batches of one. His set of liquid ink bottles sits in a rainbow assortment, behind the fountain pen display case, at the rear of the store. He also carries a wide assortment of letterpress cards, which sit in the sunlight at the store entrance. They are part of a larger trend, where old press machines that used to make mostly business documents are salvaged by artists, who use them for more creative purposes. Peter finds many of these artists at conferences he attends, such as Ladies of Letterpress + Print Week in St. Louis, Missouri. When he finds letterpress artists who make their own designs, and who have a good sense of humour, he puts their work in the store. The card designs range from the outright bawdy to the thoughtful and professional. Left: Laywine’s custom-label ink. Right: Letterpress cards. 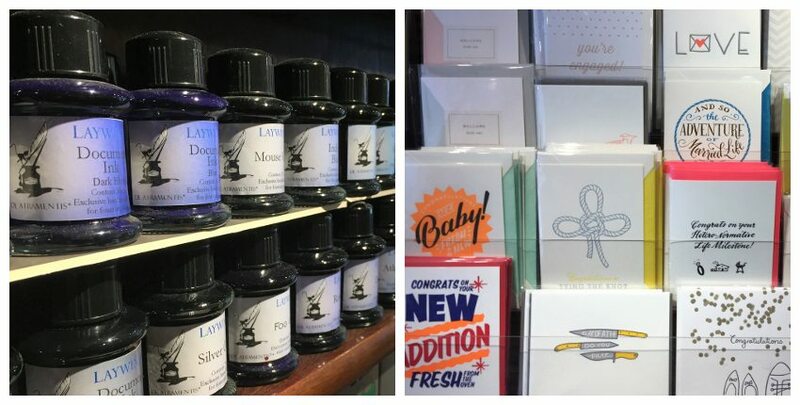 In addition to fountain pens, Laywine’s carries a wide assortment of writing instruments, paper, and accessories. Peter pulls out a gorgeous wooden tray, with a star-shaped array of sleek metal rollerball pens. They look like long bullets, polished to a shine. These are rollerball pens made by Ajoto, a studio based out of Manchester, England. Laywine’s is their only vendor in North America, even carrying some of the limited-batch EDITION Ajoto pens, which come in matte black and rose gold. Rollerball pens use refillable liquid ink, like a fountain pen. As Peter tells me, these are still a luxury pens, but easier for his busiest customers to use while on the go. A regular ball-point pen uses a lower-quality, grease-based ink, which is why writing with a ballpoint can sometimes be a bit sticky. Ajoto pens on display at Laywine’s. There are also the graceful, long scissors that customers can buy to cut the Japanese or European paper they get from the store. They are made by Merchant and Mills, a company that sells sewing supplies. Although it seems a little out of place for a pen and paper store, the studio scissors are a perfect fit: designed for cutting fabric patterns out of paper to be later pinned to cloth. Merchant and Mills studio scissors. There is a greater importance to the act of handwriting than the indulgence of luxury or a desire to create pretty things. Peter says the recent curriculum changes in Ontario that no longer make cursive writing a required skill in schools may lead to some problems. Many of his customers tell him about studies they read, finding evidence for the importance of writing by hand for memory retention and cognition. Of course, studies are often mixed in any ongoing area of research, and Peter says that newer brains may better adapt to technology-soaked learning. However, the UK curriculum still emphasizes joined-up writing, a kind of simplified cursive, as an important part of learning how to spell and confidently compose sentences. Day planners are also a hot seller in Laywine’s, as many people swear by writing down their plans by hand, so that their mind, and not just their phone, remembers what they have to do that day. Whatever your reason for writing: art, personal expression, luxury accessorizing, or learning, you will be able to find the tools to do it at Laywine’s.